You may have heard about the tent protests going on around Israel right now. It’s being called the largest social protest in the country’s history. 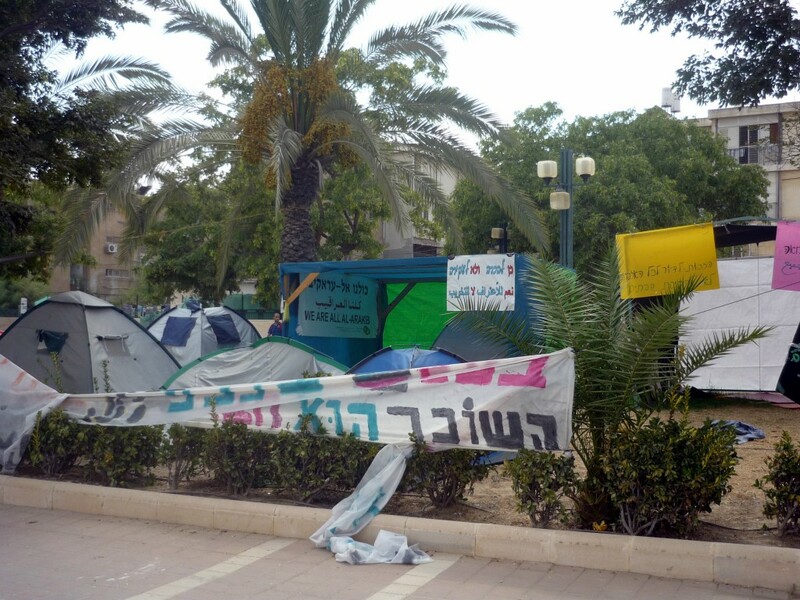 It all began in July when a woman named Daphne Leef pitched a tent on Tel Aviv’s upscale Rothschild Avenue in response to the lack of affordable housing. As with any successful movement these days, she started a Facebook page and people quickly joined her. Soon thousands of tents lined the street and it spread to other cities in the country. Here in Be’er Sheva a small tent city still sits outside the Teacher’s College on Rager. Israelis used this quickly growing movement as an opportunity to protest the state of high prices in general – the soaring prices of food and living – as well as the general state of the Israeli government, which is increasingly run by a privileged elite that is far removed from the average Israeli who is working hard to put food on the table (oldest story in the book, eh?). A lot of the rhetoric pointed to disillusionment, a detachment from the idealistic, socialist, kibbutznik roots of the country compared with the current state of affairs. Last weekend 450,000 Israelis showed up in Tel Aviv to continue the protest. For more information there’s a great article in the Atlantic that sums things up. A big aspect of the protest movement has been a boycott of Israeli’s largest supermarket chain, Super Sol. In some smaller towns in Israel, this is the only grocery store and so they are guilty of price gouging and have an unfair monopoly on the market. In most major cities in Israel, however, we are lucky enough to have quite a few shopping choices. Inspired by this Liz of the incredible food blog Cafe Liz did a bit of research into the best places to shop for food in Tel Aviv. Read that great post here. She reiterated the fact that the shuks (Israel’s open-air markets) and other small, independently owned businesses are the best places to shop. Intrigued, I wondered how Be’er Sheva would fare in comparison. As a much smaller city we are over-run with chains and there are far fewer independent grocery options than Tel Aviv. On the upside, as a smaller and less desirable location (that’s right, I said it – just calling it like I see it) everything here – from rent to groceries – is notably less than Tel Aviv. So in the name of research over the last week I went to eight chain supermarkets, three independent produce markets, one independent spice store, and the shuk. I had a number of preconceptions going into this. Namely, I was sure that I would find that the shuk was far and away the cheapest for meat and produce, and that Eden Teva (our version of Whole Foods) would be outrageous. What I found turned things on their head for me a bit. About the markets: I visited six different supermarket chains: Eden Teva, Super Sol Deal (two locations), Mega (both regular and Mega Bowl), Machsani HaShuk, Maman, and Tiv Taam. I live in the Gimel neighborhood so my research is skewed in that direction; supermarkets in Ramot, for example, were not surveyed. Eden Teva, Mega, and Tiv Taam are all in The Big, our large shopping center and one of the main arteries of life in Be’er Sheva (I visited these on September 4). Super Sol, Mega Bowl, Machsani HaShuk, and Maman are located at Rehov HaOrgim off Sderot Ben-Gurion (near the Hot building; I went to these on September 5). It’s a strange, industrial-looking complex that can be reached by car or the 14, 16, or 24 buses. Finally, I visited the Super Sol (also on September 4) that I most frequent near the government offices on Rager onto Wolfsohn (you can see it from Rager). I also went to the Shuk plus three other independent produce markets (all on September 9). Fruit and Vegetable King is right on the intersection of Ben Zvi/Haim Yahil and Keren HaYesod. Tnuvet HaNegev is just a few stores down on Haim Yahil (away from the Train Station). The last is the produce store on Arlozoroff and HaShalom, whose prices are quite high (and are not included in the chart below). There are some items that are the same across the board. Cucumbers should cost NIS 2.99/kilo and no more than 3.99. Tiv Taam, however was charging 6.99 this week! Eggplant is another staple of the Israeli diet that can be found from NIS 1.99/kilo to 3.99, which is at the high end. Tomatoes (I’m talking the standard tomatoes, not the nice vine-ripened ones) should be NIS 2.99/kilo, although I saw them at some places for 3.99 and at Tiv Taam for a whopping 6.99! Onions should be about NIS 2.99. All prices in NIS (the New Israeli Shekel) and by the kilo, unless specified otherwise ($1 USD = about NIS 3.59). For the Shuk I listed the lowest price I found but they vary wildly – you need to shop around. I typically buy most of my dry goods – couscous, lentils, popcorn, and spices at the spice shop (Maimon Spices) in The Big next to Mega. They also have an excellent selection of dried fruits and nuts, tea and coffee (although I typically bring coffee back from the states or buy it at the Shuk for NIS 5/100grams). I was seriously shocked to find that Eden’s prices on the dry goods I checked were lower! I won’t stop shopping at Maimon Spices entirely because I do like supporting the independent shops, but it’s something to be aware of. Typically the bulk options at these two places is significantly less expensive than purchasing it pre-packaged at the supermarket. Also not included here, a new spice shop has opened on Haim Yahil and Keren HaYesod, in between the two produce shops. I won’t devote a lot of time to dairy as milk and eggs are price controlled in Israel (of course at many merkolets and gas stations they’ll hike up the price illegally). Eggs should be NIS 11 for 12 medium eggs, 12.15 for large, and 13.25 for extra large. I often buy eggs at the shuk, which are NIS 25 for 28 extra large eggs so cheaper than the supermarket. You can also pay way more (up to NIS 20/dozen) for “organic” eggs at most supermarkets. For supermarket dairy prices I compared the price of a 250 gram container of Gad Dairy Ricotta (you know the brand – it’s blue and white and says “ricotta” in English on top) across a few different stores. 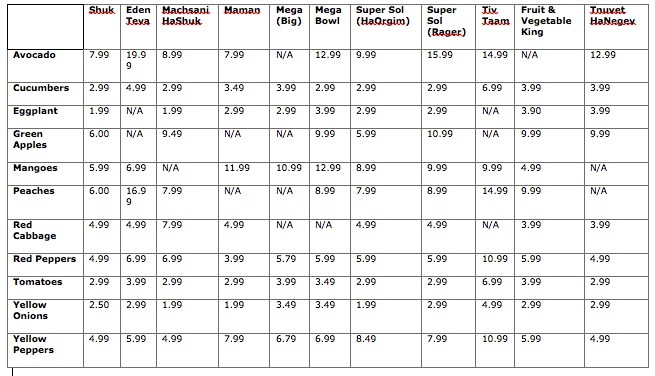 Super Sol (both locations) and Machsani HaShuk proved to be the cheapest, offering it at NIS 13.99. Mega in the Big has it for 14.99, Mega Bowl for 15.29, and Tiv Taam for 16.18. Also, I love my 1-liter containers of buffalo yogurt, which I buy either at the health food store near me (which I haven’t mentioned yet; it’s behind the Leonardo Hotel) for 21.99 or at Eden for 22.99. The only other place that I’ve found it is at Tiv Taam for 16.50/half liter. For some nice boutique cheese, check out the health food store in the Big, which stocks delicious goat cheese from Naot Farm here in the Negev. And on Fridays the Farmer’s Market sets up in the Seventh Avenue Mall and there is a lovely, reasonably priced cheese stall with sheep’s milk cheese and yogurt. I typically buy pita at the big baker in the shuk (NIS 6 for 10) or at the bakery on Arlozoroff and HaShalom (NIS 13 for 12). Both are very good and fresh. 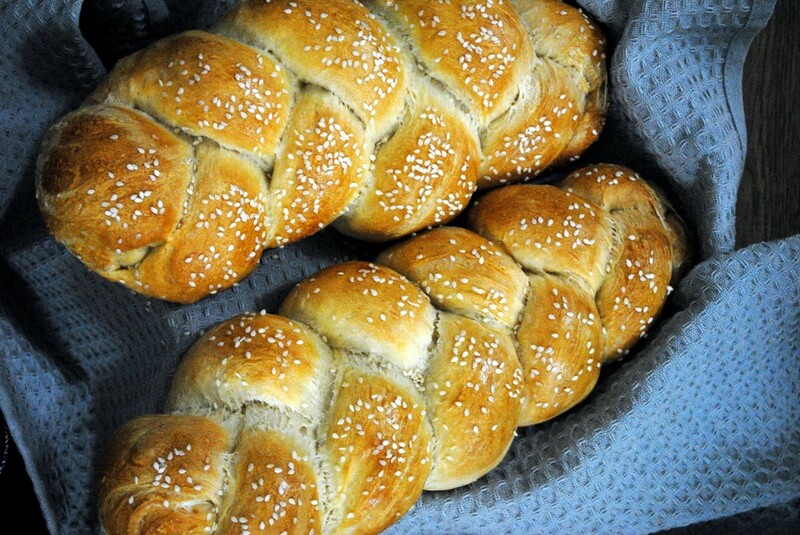 My new favorite place to get challah is at the bakery on Keren HaYesod next to Hummus Said. I can’t recall the price but it’s well worth it. They also have awesome pastries like eclairs and Napoleans (!) and the people are super nice and speak English. I find meat, poultry, and fish prices to be incredibly variable and also more expensive then back in the States. We now only rarely eat red meat because it is prohibitively expensive. When we do I buy the ground beef at the Super Sol near Rager for NIS 35-40/kilo. If we want something special then I will go to Shiri in the Old City (Trumpeldor 45, 08-6271926 ). If you miss American-style cuts (think flank and skirt steak) then he’s your man. He also has nice lamb chops, frozen sausage (sometimes chicken sausage) and other goodies. Prices are reasonable considering the quality. For chicken it’s obviously cheapest if you buy a whole chicken and either roast it whole or cut it up yourself. Prices per kilo for a whole chicken were NIS 12.99-16.99 at the supermarkets I checked. Chicken thighs are the next best option at around NIS 17/kilo (with the best prices at Mega Bowl). Whole chicken breast will run you at least NIS 26/kilo and if you want it pounded thin for schnitzel that will drive up the price tag to NIS 29.90/kilo and more. Finally, for fish your only (and best) option in Be’er Sheva is frozen. The fish at the shuk, which is typically sitting in the heat and covered in flies, does not look appealing to me. Also even if it appears to be fresh 9 times out of 10 the fish was frozen and has been defrosted. Eden has some of the nicest frozen fish with grouper for NIS 78.90/kilo, sole at 54.90/kilo, and salmon ranging from 74.90-99.90/kilo. Mega Bowl often has nice frozen fish as well like tilapia for NIS 49.99/kilo, haddock for 39.99/kilo, and salmon for 111.99/kilo. The frozen fish at the other supermarkets usually looks old and freezer burned to me so I avoid it. I get frozen shrimp at Tiv Taam or the Russian market on Rager (near Super Sol) for about NIS 34.90/500 grams. This comparison really emphasized how important it is to be a savvy shopper in Be’er Sheva. Prices range so much from store to store (even within the same chain) that you really have to pay attention. No one place has the best prices across the board and I was surprised to find the shuk a little more for meat, Eden less for grains, and Mega more for produce. I was pleased to learn that the Super Sol I frequent has pretty good prices (even though it is a living Hell to shop there). Basically, I am going to continue shopping how I have been shopping: go to the shuk for all produce, Super Sol for pantry items and dairy, and Eden Teva for specialty items and frozen fish (and now bulk grains as well). Where do you shop for food in Be’er Sheva? I know I’ve missed a lot here – what didn’t I touch on? Where do you find the best deals? Any tips you’d like to add for shopping in Be’er Sheva or elsewhere in Israel? International readers: what is food shopping like in your area? I <3 the shuk. And, Im beyond happy that Eden doesn't have the highest prices cause I love it there and now dont feel bad shopping there! I try not to go to Tiv Tam anymore unless I need my shellfish or pork fix! I know me too! The shuk is the best. And while some things at Eden are crazy (mangoes, peaches) a lot of the stuff really is reasonable! Madness. When I lived in Beer Sheva (97-99) there was no such thing as Eden Teva, but we did almost all our shopping at the shuk and picked up things like milk and bread at a local makolet. This is useful info for me since my husband is starting his masters degree at BGU this fall and we are toying with the idea of moving down there next spring… Thanks! Wow, you were really thorough! I can definitely see how prices are lower there than in Tel Aviv. On the other hand, I’m surprised you can’t find any fresh fish in the city! Tradeoffs, I guess. What a great thing that you did this article about where to shop in BeerSheva.I don’t know if I will have a chance to come there,but this certainly is a good guide if I did. Pity that the fresh fish situation is not so good in BeerSheva. Oh wow, thanks for sharing all this info. Though I’m not staying around the region, I am still very pleased with all the research. Good on you! Although, I am not living currently in Israel, but this type of discussion and review is applicable to anywhere in the world. The problem with comparing only prices of items is that you may compare “apples with oranges”. As you know, there are peaches and there are peaches. So, when I am shopping, I am looking for quality (although still review pricing). For instance, I bought berries (yes, we still have all the berries)in the supermarket and I bought berries in the specialty shops, like Whole Food. The berries (particularly the raspberries) that I bought in the supermarket started to get spoiled the same day I bought them, while the specialty shops’ product was still good a week later. So which one is more expensive? What a wonderfully informative post. It was so interesting the range of prices from store to store. I certainly would miss the fresh fish but if the stores offered good quality frozen goods, I’m sure a recipe could be created to appreciate it. Thank you Joanne! I do miss fresh fish but once defrosted you can use frozen fish the same in any recipe. We also have less variety of fish than back home, which is probably what I miss even more. It is so interesting how this is the case around the world! I used to live in the South Bronx and the supermarkets there were expensive and had the worst produce – counter-intuitive as it seems it was cheaper to grocery shop in Manhattan! Ahhh Costco – it’s definitely hard to get used to “bulk” shopping and you need the room to store all the extras! What a fabulous and well researched post. I love reading about Israel, and this is so interesting. No matter where you live, you gotta shop around. I live outside of Philadelphia and buy my produce in an ethnic market and save a ton. Last week my local supermarket had artichokes for $3.99 each. I paid 2 for $1.00 for a little smaller ones in the ethnic market. I bought six and hubby and I enjoyed just steaming and eating them . Yum. Thank you Judee! I’m glad that this is interesting for folks outside Be’er Sheva as well – I really do feel that the premise is applicable anywhere! That’s a huge price difference on artichokes between the supermarket and ethnic market! There’s nothing better than simply steamed artichokes, YUM indeed! Haha – from this post I can tell you you are very organized and thorough person! I love it. It’s a great reference for someone who’s visiting there as well. Haha very true. I was definitely, um, thorough! This is amazing, I am impressed! I am forwarding your post to a friend’s daughter who is living in Be’er Sheva and going to college. It will be so helpful for her. Thank you! Oh wow I can’t believe you know someone living in Be’er Sheva! Small world. My husband is going to medical school at Ben Gurion, which is why we’re here. I hope your friend’s daughter finds this helpful! I just heard from my friend and she was thrilled to read your post, so thank you again. It is a very small world indeed! Have a lovely weekend! I would like to share my own experience. I live in Gush Etzion but travel to B7 weekly for study, I have found that prices in beersheba are lower than our local Rami Levi in the Gush. So much lower that buying my weekly shopping while in B7 roughly covers the cost of gas for the trip! I really like going to Maman and Mahsanei Hashuk because you can go to both on the same trip and get only the specials in each. The proximity of those 2 plus mega and supersol-deal at that same location means you can buy each product at the best place. One thing I think you omitted is that the quality of the meat, especially the beef, at Maman is exceptional and prices are low. Try getting either a chuck tender (filet medume) to roast in the oven, or a bone-in rib steak there. You will not be disappointed; my wife and I agree that the meats we have from there are as good as any fancy restaurant we have eaten in, and better than most. We call them “Beer sheva steaks”. Thank you so much for sharing your experience! This is immensely helpful. That is so interesting that the prices are lower here, good to know. And I definitely slacked a little on the meat section and focused mainly on chicken. I will definitely be going to Maman for some of that Be’er Sheva steak 🙂 I think shopping between Maman and Mahsanei Hashuk is a great practice. They are a little out of my way without a car but I should start taking the bus there. thanks again! I second the recommendation of Shiri there. He sells me some cuts that Israeli’s don’t know about, so I get a great price. I think it’s all thanks to you that I know about Shiri so thanks! Wow…that is a very detailed comparison! It is amazing how much the prices vary from shop to shop. I do my shopping at several stores as prices and choices do vary but not as much. Haha, I know I know. It really is incredible the varieties in price. Thanks for the in-depth research Katherine. I work at the university and I just passed the link to your post around to my entire department (and shared it on Facebook). Oh wow, thanks! I am so glad that this is proving to be useful. 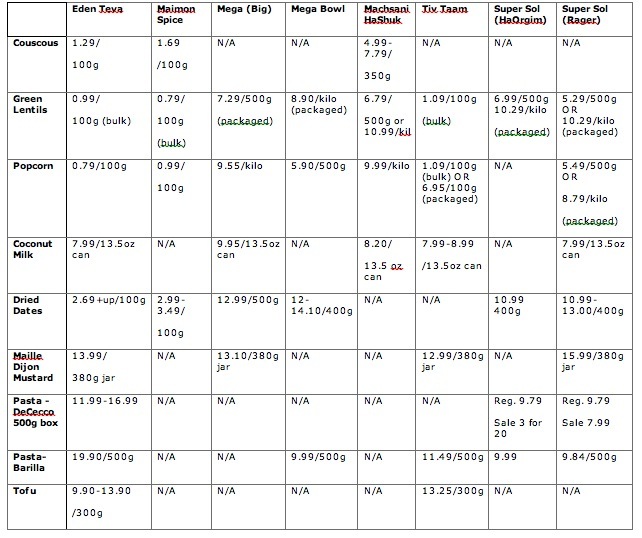 Of course many of the prices will change week to week, but I hope it will be a good baseline comparison. Great post. I also shop around, not necessarily for the best deals, but more because everything I need is not in one place. That being said, I try to keep track of prices. I have two celiac children and lucky for them, the availability and selection of GF foods has skyrocketed in the last few years. And while some people may have preconceptions about Edan Teva, it has come through big in the gf department. First, it has a better selection (and keeps items in stock) than all the other stores in Beer-Sheva combined. And much to my surprise and delight, its prices on gf products are the same as other stores that stock gf food, like Rotem Teva Market and Beer Teva. I am not surprised that Tiv Tam is more expensive. As much as I like Maimon’s store (with the numerous and yummy halva varieties and the spices), they are “guilty” of charging exorbitant prices for several items I buy on a regular basis (one particularly heinous example, gf crackers for almost 50% more than the supermarket). As if gf food items were not already inflated, Maimon added insult to injury on the assumption (I think) that they are providing some unique, irreplaceable service! Thanks for the comment Patrick! That is great that there is plenty of gluten free food available. It seems that this is the case across the board as awareness increases. And I’m not surprised (after doing this little study) that Eden’s prices are competitive. I’m very glad that they came to Be’er Sheva last year. That’s ridiculous that Maimon charges that much for gf items, good to know. On a personal and vaguely related note I have been reading up on celiac’s and want to make an effort to be more conscious of gluten intolerance on my blog; one goal is to go back through all my posts and tag them gluten free when appropriate. Thank you for your thorough and interesting article. Like you, I love going to Maimon’s spice store, Eden Teva and the Friday farmer’s market. If you haven’t already done so, you might also want to try Rotem, the health food and spice store on Rehov Rambam in the old city. As to fresh fish, there are actually quite a few really good options in Beersheva. First of all, the shuk — the best (actually the only one I’ve ever tried) is Ilouz’s stand. They have a full range of frozen fish, but more importantly, they have excellent, very tasty, very fresh fish. They often have salmon flown in fresh from Norway, although they also have frozen salmon, which is cheaper. They also have many fresh local varieties — denise, labrak, musar, trout,bouri, amnon, locus, farida, and more. They are very nice, very helpful and also give tips and cooking information. Ilouz has a second fish store, together with a butcher’s shop in the parking lot at the end of the Tenuva compound. Another very good market with a wide selection of excellent fresh and frozen fish is Shuk Hadagim, on Rehov Hadasa in the old city. In addition, many supermarkets have added fresh fish counters. Try Supersol on Rager — the fish counter is in the back corner. They usually have quite a few different kinds of fish, which they will clean, cut and even filet to order. Don’t be put off by the idea of buying fresh fish — there are many different possibilities and the fish is really really good. Liane, thank you so much for your thoughtful and informative reply! I am so thrilled that this post has generated interest and a dialogue about where to shop for food in Be’er Sheva. You are right that I should have included the fish store behind Tnuva and others have emailed me echoing what you said. I will go back in and add it. I have been there once and found it to be good but then I recommended it to people who came back to me saying that they were not at all happy with the quality. After that I didn’t feel comfortable recommending it, but since I’ve heard from a number of people that it is fabulous I’m hoping my friends just had a few bad experiences and were the exception. I haven’t been to Shuk Hadagim and am always excited to check out a new food store of any kind! Thanks for the recommendation. And I’m glad to hear that the fresh fish at Supersol on Rager (the super I frequent) is good quality. I haven’t much paid attention to it but will change that now! Back in New York I used to buy almost all of my fish at the farmers market where it was caught that morning and so fresh you could eat it raw. I didn’t buy fresh fish in the supermarket in New York either! But I will adjust the way I think about it and give it a shot. Thank you again! Really helpful. What’s the big store called on the highway south of Be’er Sheva? Hmm good question – are you talking about the Supersol extra – it looks like a Costco-type store when you first walk in? That’s the only one I can think of, but I don’t drive in or around Be’er Sheva very often. Great! That’s a good one. Which store within walking distance to the BGU has the best prices overall, in your opinion? Thank you. Great question Julie! I guess it’s about time for me to do this survey again, and I’ll keep that in mind. I would say that the Mega or SuperSol on Ben Gurion are your best bet. Walk on Ben Gurion towards the university train station and continue on to HaOrgim (or take the bus from across the st from sports center). From Arlozoroff to there it’s about a 20 minute walk… I’m asking around to see if there’s anywhere closer! Thank you very much for the very informative post, Katherine, as well as for the answer to Julie (since I would have asked the same question). Even a year later I am sure that it applies. I am very new to Be’er Sheva, having arrived two days ago, and my new advisor at BGU took me to Tiv Taam, and I’ve noticed that the prices were higher than what I’ve seen in supermarkets in the US and Canada (not to mention Croatia, where I’m from). I plan to go to SuperSol on HaOrgim today, and check it out. Thanks once again! I will be visiting Ofakim from June 16 thru June 20. I plan to visit Beer Sheva daily for meals since Ofamim is so very small. Eating is in 1) old city 2) by Big (?) 3) by university. Can you provide street addresses? On Thurdsday June 20 we plan to visit the Camel Market. WE do want to vist the Shut in town. What is the stree address. I was hoping you were still following this blog. When you say Seventh Avenue Mall are you talking about the Mall 7 near the big iMax outside of the city? I know this post is a few years old, but oh my gosh thank you so much!!!! I just moved from Jerusalem (where I could write I blog post like this about all the shops and prices) to Be’er Sheva and with everything spread out more I’m been trying to swim to find the best prices/quality for everything. It seems that Eden is really the only organic store right?